Numerous research studies are now shedding an increasingly bright light on the dietary and lifestyle factors related to disease. Today, most physicians recognize the significance of poor diet in the development of top diseases causing death in modern societies including heart disease, hypertension, cancer, and strokes. Furthermore, health care costs continue to escalate to the point that drastic measures are now being taken in a number of countries across the globe. Despite the benefits of longer life, better quality of life, and lower health care costs associated with prevention of disease through better diet and lifestyle, very few countries are investing in a real change in medical approach. If we follow our current knowledge that low stress lifestyle, combined with proper diet and nutrition are essential to eliminating these modern diseases, then Ayurveda is a simple solution to our looming healthcare crisis. For thousands of years Āyurveda has shown the way to effectively and simply maintain a physical and mental state of well-being through natural diet, herbal medications, and other therapies together with the precepts of Dharm. Ayurveda means “knowledge of living” or “the science of life.” This holistic science is based upon proper diet and hygiene as well as non-toxic plant-based medicines, and healthy lifestyle. 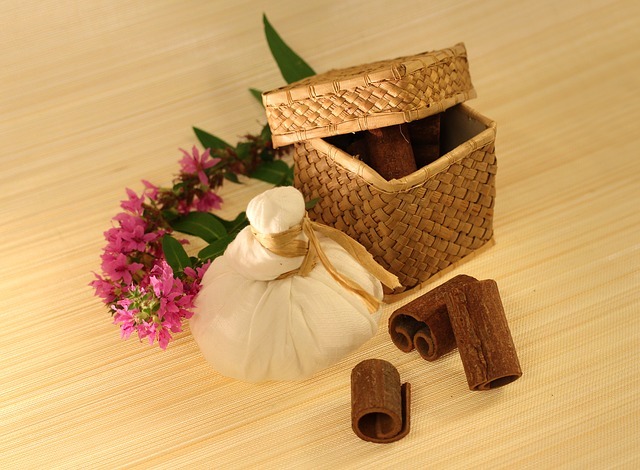 Though Ayurveda is at least 5,000 years old, it is more relevant than ever in this modern world. While modern medicine has developed miraculous advances in rescuing patients from the brink of death, but Āyurveda offers the possibility of preventing those diseases and disasters in the first place. Āyurveda provides an opportunity to raise the quality of health for our population, rather than wait for the body to break down from neglect, and then rush in during a crisis to “save the day”. As Benjamin Franklin was fond of saying, “An ounce of prevention is worth a pound of cure.” A small investment in Āyurvedic approaches to health could save both lives and a fortune in healthcare expenditures. According to Āyurveda, one which causes pain and distress is disease. Diseases occur out of two fundamental categories: 1) Natural or Inherited, and 2) Created after Birth. Natural or inherited disease include disorders like Down’s syndrome, blindness, muscular dystrophy, and others that come from genetic causes, chromosomal abnormalities, and developmental disorders in the fetus. Those diseases that are created after birth are primarily of two types: (1) Physical and (2) Mental-Emotional. The Created Physical diseases are further divided according to whether they resulted from imbalance of the doshas, are due to past karma, or resulted from a combination of those two factors. Diseases created by passions, anger, greed, infatuation/delusion, egoism, jealousy are called mental-emotional diseases. Mental distortions are due to likes and dislikes which are derived from the ego. These likes and dislikes lead to desires to have the world occur in a certain way (according to our likes). Issues such as disappointment, grief, anger, lust, and jealousy occur when we do not get our way. When these thoughts and feelings become chronically imbalanced, disease develops. 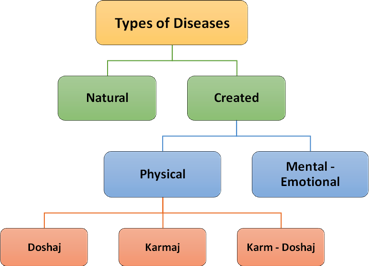 Dhoshaj: the diseases created by imbalances in the three doshas-Vāt, Pitt, and Kaph. Karmaj: These diseases are created due to the effects of karmas from our prior incarnation. They result from the destiny related to the law of “Cause and Effect”. These diseases must be cured through suffering, repentance, mantra chanting, and satsang and are not relieved by treatments. Karm-Doshaj: The diseases created by both dosha and past karmas are called karm-doshaj. In these diseases, part of the problem is due to the imbalance of the doshas and results in suffering. This suffering is significant because the part of the problem due to the past karma. This past sinful karma must be atoned through the suffering. Medical treatment can help, but the ultimate remedy for these disorders is Jap (chanting of sacred mantra). It is not possible to achieve all of these endeavors successfully without a healthy body, a balanced mind and a spiritually inspired life. That is why it is necessary to keep both body and mind in perfect health, or Nirāmay. Because of this requirement, Āyurveda considers all aspects of life in relation to health: not 0nly diet, hygiene, and medicine, but also lifestyle; not only the physical aspects of life, but also the spiritual. Spiritual well-being is more important than material well being. Material well-being yields temporary fulfillment, and only fleeting happiness. This aspect of life is attractive and convenient and is chosen by many, but its blessings are inevitably short-lived. The path of material well-being ends in unhappiness because it is impermanent and ever changing. All worldly pleasures end in sorrow, and the greatest wealth will buy you neither true happiness, nor eternal life; whereas spiritual fulfillment brings peace and everlasting bliss.